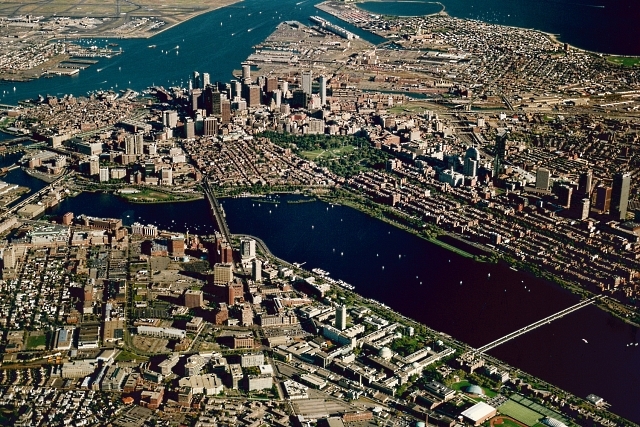 In 1965, the CRA and the City of Cambridge adopted the Kendall Square Urban Renewal Plan (KSURP) with a primary goal of providing to NASA land for an Electronic Research Center. In order to transform the 42-acres of urban blight into vacant land suitable for development, the CRA acquired 70 parcels of land, relocated 100 businesses, demolished 50 buildings, filled the Broad Canal, and constructed public infrastructure improvements and roadways. In 1970, NASA abandoned its operations in the project and transferred its interests to the U.S. Department of Transportation, to create the Volpe Transportation Research Center. The CRA retained the advisory panel services of the Urban Land Institute (ULI), which concluded that “Cambridge Center is a unique opportunity area, one that should be reserved to maximize its locational advantages.” In 1978, the CRA designated Boston Properties as the developer of Cambridge Center. As of December 21st, 2015, City Council passed a major amendment to the KSURP in order to accommodate additional development planned for by the City of Cambridge's K2 Planning Process. The amended Master Plan provides for over 4 million square feet of new development in 19+ buildings across three development blocks. The project accommodates a wide range of complementary uses: first-class office space and biotechnology laboratory space; hotel and retail space; more than 150,000 square feet of major public open space, parks, and plazas; and 400,000 square feet of residential housing opening in 2018 and beyond. 1964 Federal government requests that the Cambridge Redevelopment Authority (CRA), created under provisions of Title of the Housing Act of 1949, initiate an urban renewal plan for the Kendall Square area. 1965 CRA completes Kendall Square Urban Renewal Plan and obtains all local (Planning Board & City Council), state (Division of Urban Renewal) and federal (Department of Housing and Urban Development) approvals. 1966 National Aeronautics and Space Administration (NASA) executes land disposition contract with the Authority to develop the Electronic Research Center (ERC) on 29 acres. The CRA acquires, clears and disposes 6.3 acres to NASA. 1967 CRA begins concept planning for 13-acre “Golden Triangle” to be privately developed. 1968 CRA acquires, clears, prepares and transfers 4.2 additional acres to NASA. 1969 Developer interest solicited for Golden Triangle development. 3.8 additional acres acquired, cleared, and conveyed to NASA. 1970 NASA closes ERC and moves to Houston; CRA works with Department of Transportation Secretary, John A. Volpe, to transfer use to DOT as the Transportation Systems Center (TSC). 1971 DOT agrees to release its rights to the “surplus NASA” land north of Broadway and west of Sixth Street, an 11-acre site; CRA begins re-planning efforts. 1972 Revised concept plan prepared by the CRA and presented to developers, City Council and Board. 1973 City council reviews CRA plan for job-intensive uses on surplus NASA land and mixed-use development on the Triangle; plan is rejected and Kendall Square Task Force appointed by mayor Acherman. 1974 Task Force recommendation of light industrial uses on Parcel 2 (surplus NASA land) rejected and the Neighborhood Plan for mixed use adopted by the Council. 1975 CRA secures $15 million grant from grant from HUD towards completion of the project; Environmental Impact Study commences. 1976 CRA brings in Urban Land Institute panel to review the project and recommendations for mixed use are made to the City; GSA approves the surplus NASA land transfer; EIS completed. 1977 City Council unanimously approves Amendment No. 1 to the Kendall Square Urban Renewal Plan and Zoning Ordinance Amendment creating the Mixed Use Development District. 1978 HUD approves EIS; CRA selects Boston Properties as developer for Parcels 3 and 4 (land south of Broadway, the Triangle). 1979 CRA executes development agreement with Boston Properties, anticipating 1,500,000 square feet of privately financed development on the Triangle. 1980 Construction begins on the first building of a 13-story, 243,426 square-foot office building with ground-floor retail at Five Cambridge Center. 1981 Groundbreaking for a second 12-story 209,730 square-foot office tower with ground-floor retail at Four Cambridge Center; Authority secures $5.1 million grant for transit-related improvements (pedestrian walkways, bus contraflow lane, transit plaza and Thomas J. Murphy Park at the apex of the Triangle); construction on Five Cambridge Center completed. 1982 Five Cambridge Center fully leased; Four Cambridge Center completed and construction begins on 863-car garage; Agreement reached with Boston Properties on the development of Parcel 2 (surplus NASA land) and construction commences on Fourteen Cambridge Center, a 62,576 square-foot building for Biogen; construction commences on 130,310 square-foot research facility at Nine Cambridge Center for Whitehead Institute; CRA continues public improvement construction. 1983 Four Cambridge Center fully leased and 863-car garage between Four and Five Cambridge Center opens for parking in April, both managed by Boston Properties; construction on Fourteen Cambridge Center completed in June and under management by Biogen. 1984 Construction on 78,636 square-foot, 4-story office building at Eleven Cambridge Center for the headquarters of the Open Software Foundation completed in June; construction completed on Nine Cambridge Center (Whitehead Institute) in summer. 1986 Construction completed on 330,058 square-foot, 25-story, 431-room Marriott Hotel at Two Cambridge Center in September. 1987 Construction completed on 103,630 square-foot, 4-story building at Three Cambridge Center in March, providing office space, ground-floor retail, food court, and outdoor seating on plaza; reconstruction of Kendall Square station and construction of new traction power substation on MBTA Red Line completed in spring. Construction completed on 215,377 square-foot, 12-story office building at One Cambridge Center and occupancy begins in September. 1988 Construction completed by CRA on major transit plaza between One and Three Cambridge Center, providing setting for outdoor dining and scheduled activities, owned by CRA and programmed and maintained by Boston Properties. 1990 Construction completed on 145,603 square-foot, 7-story building at Ten Cambridge Center in March, to be fully occupied by Biogen later in year; 1,170-car parking facility in central portion of Parcel 2 opens for parking in June; CRA completes basic public improvements throughout project area in June, including construction of new street network and Thomas J. Murphy Park, as well as landscaping of existing spaces, planting of median strips, brick sidewalks and a pedestrian walkway. 1991 Boston Properties completes construction and maintains park on Parcel 2, as publicly accessible open space. 1993 CRA approves construction on 148,228 square-foot, 6-story biotechnology lab and office building at Twelve Cambridge Center commences by Biogen, under terms of ground lease with Boston Properties; Planning Board and City Council on Zoning and Urban Renewal Plan Amendments. 1996 Construction completed on 60,000 square-foot addition to Nine Cambridge Center. Competed addition brings Nine Cambridge Center to 197,519 square feet. 1997 Construction commences in November on 187,474 square-foot, 15-story, 221-room hotel at Six Cambridge Center, to be operated as Residence Inn by Marriott. 1998 Construction commences in February on 176,562 square-foot, 9-story office building at Eight Cambridge Center, to serve as international headquarters for Cambridge Technology Partners. 1999 CRA installs public improvements and construction completed on Six Cambridge Center; construction completed on Eight Cambridge Center and initial occupancy begins in June; construction commences in June on Fifteen Cambridge Center, a 218,288 square-foot, 6-story research and development building, between Boston Properties and Biogen, to be owned, occupied and managed by Biogen. 2000 Building moratorium adopted by the City of Cambridge; City undertakes comprehensive study of land use. 2001 Planning Board and City Concil approves an increase of 200,000 square feet of residential uses for the project area. 2002 CRA convenes an advisory ground known as the Housing and Open Space Coalition, with a charge to present to the Authority recommendations for Parcel 1; approval by the Executive Office of Environmental Affairs and Department of Housing and Community Development of Parcel 3 development (i.e. Seven Cambridge Center). 2003 Biogen announces its plan to merge with Idec; Boston Properties and the CRA reach agreement on the minimum land purchase price for residential uses on Parcel 3; the Authority and Boston Properties working on the “Broad Institute” as a possible tenant for the Parcel 3 commercial space. 2004 Biogen announces plan to proceed with expansion of Twelve Cambridge Center; Board of Zoning Appeals approves variances to allow Boston Properties to proceed with Seven Cambridge Center for the Broad Institute and a parking garage. 2005 Approximately 670,000 square feet of development are under construction (Seven Cambridge Center on Parcel 3). On Parcel 2, Biogen includes a co-generation facility (which converts gas into steam and generates up to 5,500 kilowatts of electricity). 2006 Congressional approval of a $750,000 appropriation for street improvements in Kendall Square; and $1 million for open-space development. Design of both projects commences. 2008 Microsoft and Google both announce Cambridge locations; Akamai signs 185,000 square-foot lease; Broad opens followed by an announcement of a $400 million permanent endowment. A Land Disposition Agreement for housing to be built on Parcel 6 was approved. Plans for the development of a linear park along the CSX rail line continues. 2009 Funds from an earlier earmark were transferred to improvements on Broadway identified by the City of Cambridge. 2010 CRA approves Schematic Design Phase for the expansion of the Broad Institute at 75 Ames Street. Authority approves redesign of the Charles C. Nowiczewski Plaza at the Marriott. 2011 The Cambridge Planning Board and the City Council approve a zoning amendment increasing the allowed GFA for lab space by 300,000 square feet. 2013 Boston Properties completes the construction of 17 Cambridge Center at 300 Binney St., a 188,000 square-foot office building designed to accommodate future research lab use. The building is leased to Biogen and includes an on-site daycare facility on the ground floor. 2014 Boston Properties finalized the expansion of the Broad Institute at 75 Ames Street, providing 246,000 sq. ft. of office and laboratory space in front of and over the Cambridge Center West parking garage. The connector buildings between Three, Four and Five Cambridge were also completed, creating a unified office campus for Google. 2015 The Cambridge Center project was rebranded as Kendall Center and individual buildings were provided city street addresses replacing the Cambridge Center numbering system. 2016 The DHCD finalized the 10th Amendment of the KSURP providing for an additional 600,000 sf of office and lab space and 400,000 sf of residential development consistent with the K2 Plan. The EIR for the amendment launches the Kendall Square Transit Enhancement Program (KSTEP) to fund investment to improve transit service to Kendall. 2017 The City and CRA approve the Infill Development Concept Plan required by KSURP and MXD zoning. Vertical construction began for 280 units of housing at 88 Ames Street. The former 11 Cambridge Center is demolished and site work begins for 145 Broadway. 2018 Vertical construction proceeds for a new global headquarters for Akamai Technologies at 145 Broadway. CIC announces it is opening up over 80,000 sq ft of innovation space within 255 Main St. within office space formerly occupied by Microsoft. 88 Ames is anticipated to open along with a new streetscape for Ames Street and improvements to the 6th Street Walkway.